This is an old kit and at its time it was considered really good. 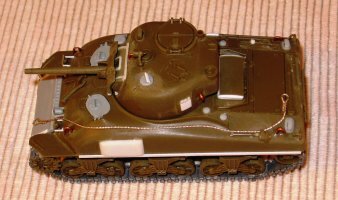 Nowadays the kit has two olive drab mouldings for the tank, one grey moulding for the link and length tracks and the flexible tracks. These last ones are hardly usable, being made in a flexible plastic (polyethylene?) that is too stiff and hardly fixable with glue or welding. The type proposed is part of the last hundred Pressed Steel Car batch of the M4A1 75mm, just before the new M4A1 with the T23 turret and the 76mm production started. This batch of the M4A1 75 mm had the high bustle turret D50878 and the new large hatches hull (the serial range I suppose should be between 3070397 and 3070496, being tank 3070459 for sure). The kit dimensions are quite correct (being only a millimetre short) and only some details are really poor. Every additional armour plate is missing (according with the production type proposed they were of the cast-in type). The tanker figure is usable with some work. 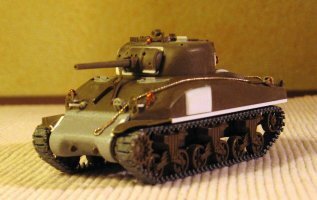 The kit gives you the engine deck opened and the radial engine used by the M4 and the M4A1 is comprised in the kit. The flat front is a bit too forward. I filed it back a millimetre and restored the right curves after having added some putty inside to avoid a hole. The cast-in armour is missing and was added following the photos you can find here. The split hatch ring wrongly has a square section. The outer side was rounded to have a quarter of a circle section. 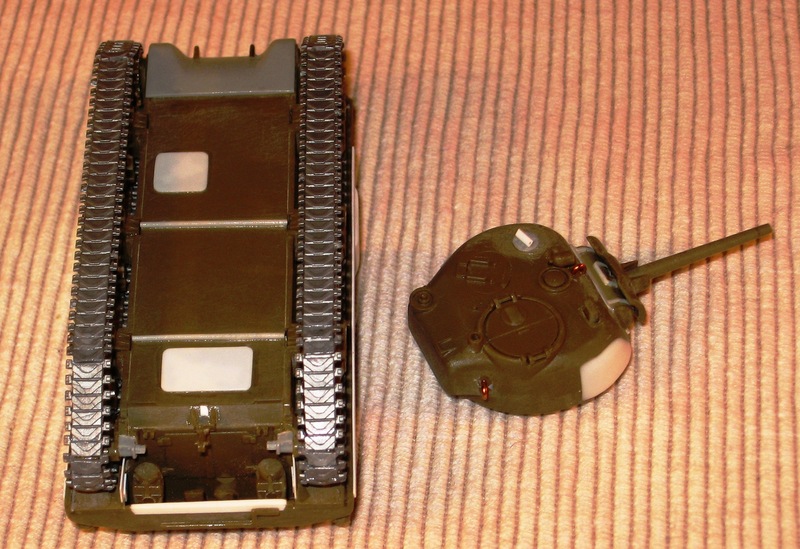 The M43A1 mount needs to be assembled from the inside. I've added new flanges upper and under the mount (not on the sides for a late mount type). I've added the vertical reliefs that stay on the mount, behind the mantlet. The mantlet was made smoother sanding the corners, being a cast piece. The MG hole was opened. The pistol port was lowered with a file, widened and refined. I made new lifting points with metallic wire. The Very pistol hole was opened on the top. The fuel cap covers are unacceptably undersized. I drilled 2mm holes in their place, I've then inserted from inside a 2 mm diameter rod with the end rounded before gluing the two hull halves. 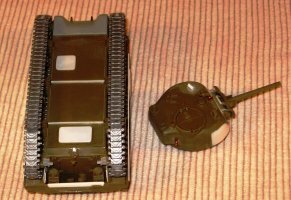 I used a Dragon spare transmission cover but the kit transmission cover can also be used (pay attention: it is upside down in the kit instructions) moving backward the towing points that are too much forward. The right side air fan is wrong. I've filled the hole with plastic and a new housing was carved following the photos you can find at the.shadock.free.fr/sherman_minutia/index.html. 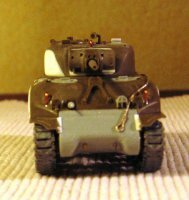 (It is the same as you can find on a M4A1 76mm hull.) I've used a spare cover from a Dragon kit. The upper back plate notch was filled with plastic. The edged areas in front of the hatches were sanded to make them smoother. The cast-in armour were added following the photos you can find at the.shadock.free.fr/sherman_minutia/index.html. The belly isn't correct for an M4A1. I've erased the removable bolted plates and changed them with others made from plastic sheet in the correct positions. I've also added the two transversal rods. The fender structures were added. The hatches were changed with Dragon spare parts being more detailed. I've added the horizontal rods to the front light brush guards. A new ball mount for the bow MG was made with plastic. The piece number 31 was widened with 0.50 mm rod on the three sides without the hinges. When assembling it, I kept the hinges nearer the raised edge in a more correct place. I've detailed the shovel bending the rod and rounding the blade. The hatchet was detailed with an oval section and "S" bended handle. Also the pick was detailed with a new centre, being clearly unbalanced. The lateral air intakes on the engine deck were changed with Dragon spare parts. The three holes for the shelf (pieces 34 - 37) were filled. I've seen it only in one photo of this type tank in training. I didn't use the spare track packs. I've no photo showing them. The interlocking hole of the towing hook on the back plate was filled and the hook base was emptied, being a vertical "U" bent stripe. The exhausts are missing and were made with plastic. The exhaust deflector is missing and if you want to use it, it must be found in another kit. The track tensioners are missing from the rear plate; they were added with Dragon spare parts. A towing wire was made with copper wire. 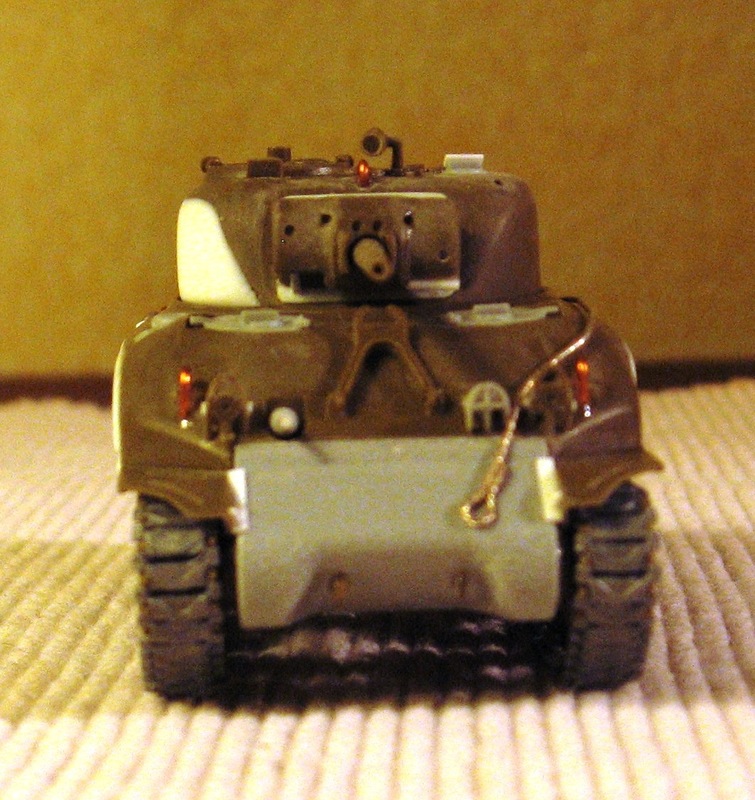 I used the bogies knowing that they are a bit tall and that the reliefs on the return rollers arms are missing. The wheels are of the cast type. They have two different sides. I left the deepest one inside. The kit sprockets were used knowing that they have the wrong teeth number (one is missing). They are otherwise well done (and if you use the sand skirt the problem is not visible). I used the hard plastic tracks. As already said the flexible tracks are made with a problematic plastic and I'm not sure how it keeps the paint. I think that a couple of additional links were welcome. Anyway, if needed the spare links (A44 - A49) can be used with some work. There are only the white stars for an anonymous tank and some little number to make a serial. For my M4A1, I had to use another source. 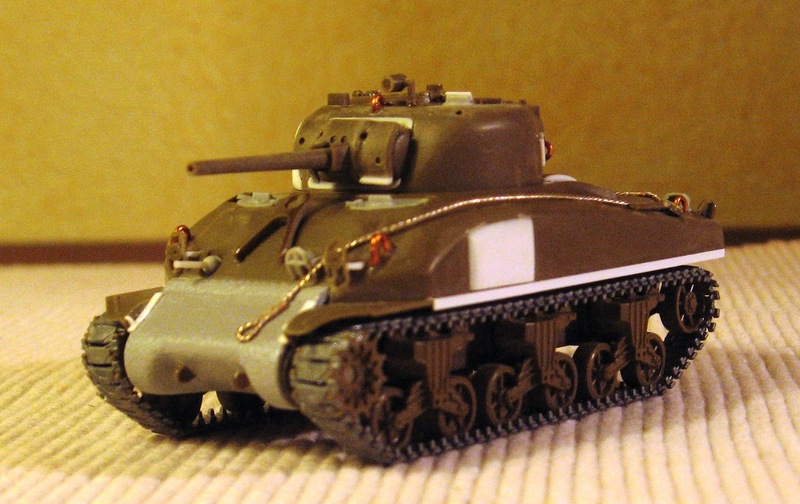 Well, knowing the fact that is one of the rarest Sherman tank you can find on a front line photo, why choose this kit? As far as I've seen, almost every tank of this type was used as an amphibious Duplex Drive. After D-Day there were tanks re-converted to the normal standard, often keeping the propeller attachment points and the special idlers. Often the front fenders were missing too. 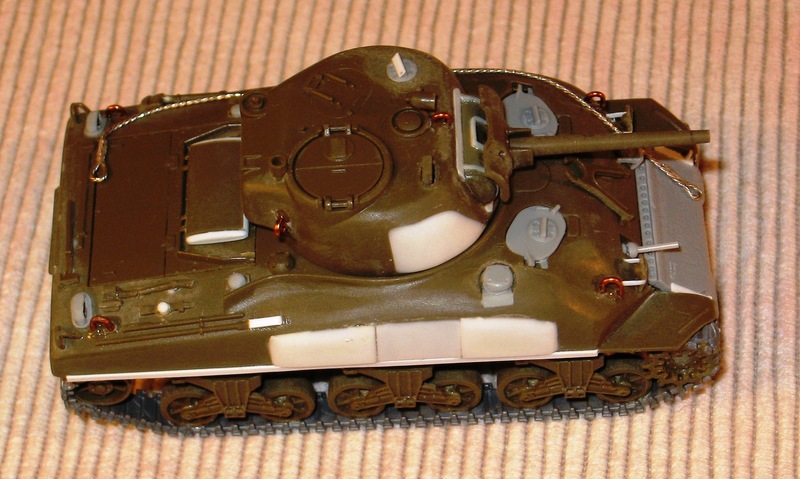 This type was used in both configurations by the 70th, 741 st and 743rd Tank Battalions. Two reconverted tanks are visible in photos of the 2nd and 3rd Armored Divisions. It had the same fate in the British Army, were some Duplex Drive's were in the 8th Armoured Brigade. Some reconverted tanks were also used in the seldom photographed 33rd Armoured Brigade (see for example: here). 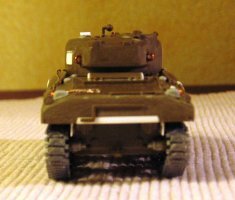 So, although they were few, they were used by no less than seven operational units giving us a quite large modelling opportunity. The kit is clearly old but I think still usable, also with a T23 turret if you don't like it with the 75mm turret (in this case don't add the hull cast-in armor: it had a wet stowage hull). I think a good hint for a conversion could be to use it to make a DD (not an easy job). 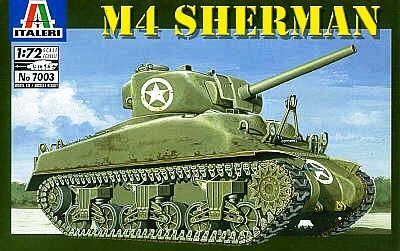 As far as I know, this is the only 1/72 Sherman injection kit with an engine, another good hint for a diorama (and not necessarily with this kit).